Yep! That's right. I currently have sitting on my shelf Scarlet, the second book in the Lunar Chronicles! Technically, it's not actually mine. Just mine for a bit. Katherine (from The Lady Critic's Library), one of the Ottawa Bloggers, received a copy of it, and agreed to share it with the rest of us. 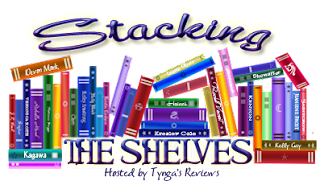 We have little list and each blogger is reading then passing it along. And now it's my turn! So thank you Katherine for letting us borrow it, and thanks to Kathy (from A Glass of Wine) for passing it along! 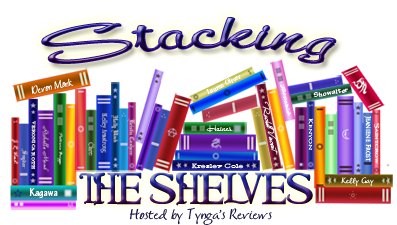 What did you stack your shelves with this week? Ahhhh! That's so awesome you guys :D I traded that with Katherine! Won it off Twitter! I hope you guys enjoyed it. I know I did :D ENJOY! 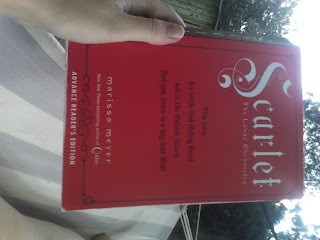 I've read awesome things about Cinder and now everyone wants to read Scarlet ^^. So I guess I should read Cinder soon ! I hope you'll like this one :).